So you've arrived in Chicago and booked an Airbnb. You ask the host where and what the nearest public transportation is to check out some of the great nightlife around Chicago. They tell you that a short few blocks away is the "brown" train line. Have no fear! If you’re looking for a good night out on the town, and a way to get around at the same time, you're in luck. Welcome to our 4 part series of “The Best Bars Around the Chicago L”. We’re going to go over the 5 best bars around the various stops on the Pink, Red, Blue and Brown L lines. This piece will be about the Brown Line. Let's hop on this train and get going! The Red Lion is a cozy neighborhood pub hidden in quaint Lincoln Square. The English styled pub prepares and serves fares grown locally with what it calls "Heritage Recipes", family recipes it says passed down from England for over 100 years. It features a large selection of twenty five classic and unique single malts such as Balvenie, Oban, Auchentoshan, Caol Ila, Bowmore and others. They also feature small batch Bourbons and Ryes. Their beer list includes over thirty five local, craft and imported beer, from the UK of course. For an intimate pub, that's an impressive list! Another reason to stop by The Red Lion is, if you haven't guessed, the amount of Englishness it has. From a painting of the elegant Queen Victoria and a victorious English sea battle to the staff wearing a bearskin hat (you know the ones you see red English guards wearing? ), it's a perfect place for an Anglophile to visit. Even if you're not, it's definitely a charming place to have a beer before you head to the next bar on the Brown line. Since we're on the subject of great European style bars, let's move on to one of the other great countries in Europe, Germany. 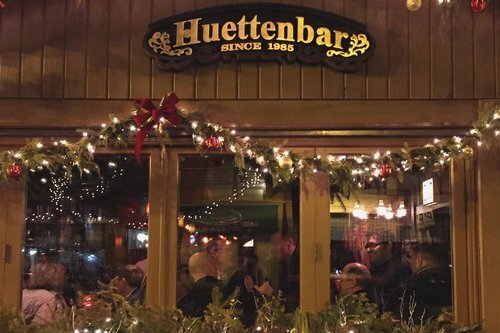 And being Lincoln Square with its traditional large German population, Huettenbar would have to be on the top of the list. Huettenbar is a classic German pub. It has an Old World decor to it like its triangular roof, wooden front doors, sloped wood paneled ceiling and a floor of multicolored ceramic tile in earthy tones. The bar name is inspired by Alpine slopes which "Huettenbar" is loosely translated as "mountain hut/bar" in German. From the moment you enter the bar to sitting down, you'll feel like you stepped into an Alpine village pub. Huettenbar doesn't serve food but it does serve plenty of German beers. It has 10 beers on tap like Kutschen Alt and Spaten and a nice selection of German liqueurs, such as Jagermeister, Westfalen Jager, Kabanes, and more fruity flavors like Edel-Kirsch, Echte-Kroatzbeere, Crazy Ananas , and Barenjager. Now that you have found an authentic German bar in Chicago, we're ready for our next stop for more great drinks! Now that you have been to two cool bars that remind you of Europe, it's time to step into a bar that has been a staple of the northside and known for its great musical acts. This bar is Schubas, a Lakeview establishment that goes wayyy back. 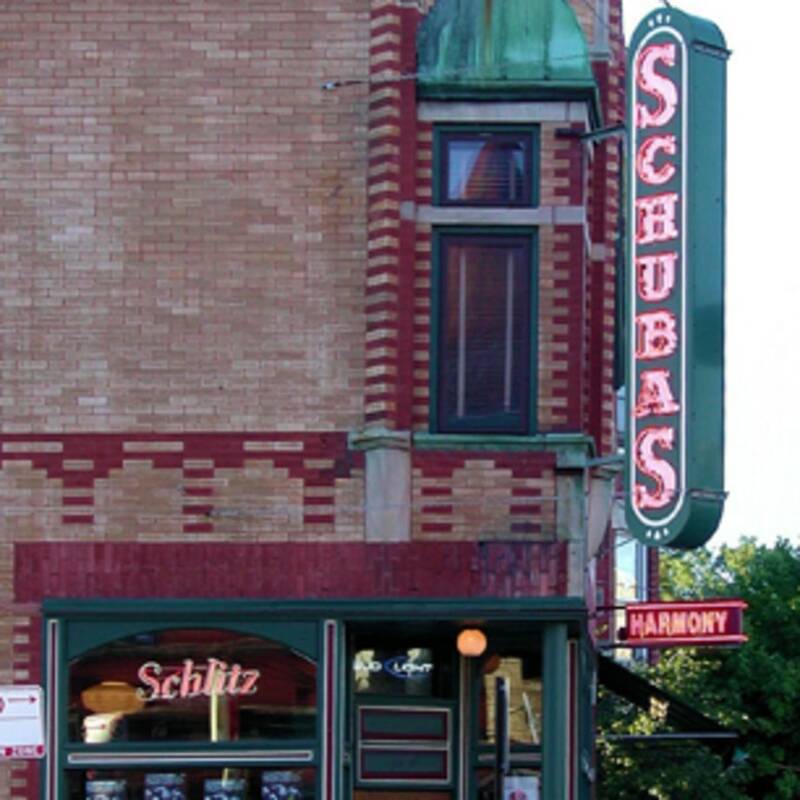 Schubas was originally built around the turn of the 1900's as one of the Schlitz Brewery tap houses (they have Schlitz in bottles today). You can tell immediately the history of this place walking in. And though it sits on Southport street, it has the feel of a small neighborhood corner bar. Entering inside, the green-painted front room opens up to a 30-foot Brunswick mahogany bar. Above are traditional looking ceiling fans with tin ceiling above. You'll see the bar room with old bar goodies like a jukebox, photo booth, old TV's and even a mounted elk head. And if you have all day, try their 70+ different types of hard alcohol, including a selection of bourbons, and several beers on draft and in bottles. But the bar is as we said known most for its live music shows. On a weekend evening, you'll hear music even before you enter the doors. This Lakeview spot has everything a music fan wants - a small inviting room, excellent sound and an atmosphere that music fans can appreciate. Local bands come to belt their music, anywhere from rock, country, funk, indie, jazz to even folk. Usually you can come to the music room without a ticket but it's a good idea to call ahead. So come to Schubas in the day for a low key affair or come at night to hear some great local music. Looking to drink at an intimate bar with great craft beer without all the hype or pretentions in Lincoln Park? Perfect, stop at Local Option! Local Option is nestled in a quiet Lincoln Park neighborhood, not far from DePaul. Which this is why it may surprised you that the crowd at Local Option is not college-heavy but instead gravitate toward a more mature crowd from later 20's to 50's. The more mature, but beer sophisticated crowd, like Local Options array of delectable craft beers. Names like Mourning Wood, Outlawger, Exorcist, Sky burial and so on. Interesting names aside, the beers are crafted strong and flavorful, ranging in alcohol content of six to as high as fourteen percent. It's definitely a craft enthusiast's dream. Food is another intriguing aspect about Local Option. They range from NOLA style fare to Mexican food. The wide selection makes you want to try it all but definitley go for their jambalaya and tacos as well as their po'boys. They are good, good, good! As our train rolls around the bend to Old Town, we get off on the Sedgwick stop. Here we step foot into Old Town, a neighborhood west of Gold Coast, north of River North and east of Wicker Park. Money seems not to be a problem with its expensive condos all around but don't be intimidated, there are many good bars here. One of our favorite bars in this neighborhood is Corcoran's. Walk into Corcoran's and get ready to explore.The first bar is small and narrow, with not much room to stand but as you keep walking past tables you'll find a cool beer garden. Sit with your friends and talk about life or just people watch as others walk by. Or keep on going and you'll step into a "coach house" of sorts known as "Thade's Room." This room is quite unique. Always happening and full of fun people, it's a place you'll always remember, even if you had too much too drink! The beer garden and Thade's Room is what makes Corcoran's a great place for a cold Sunday drink or just a really fun Friday night out. Five great spots on the Brown line for you to check out. There are plenty of more bars along this route but since we cannot make them all, check out these five first!